Carnelian is a color named after the carnelian variety of the mineral chalcedony. This semi-precious gemstone is noted for its rich shade of reddish-brown. 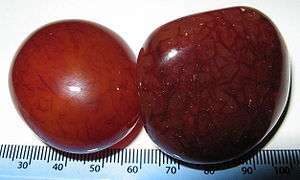 The first recorded use of Carnelian as a color name in English was in 1899. The official colors of Cornell University are carnelian and white; Carnelian is sometimes referred to as Cornell red. The Carnelian Room was a luxury restaurant that was once located on the 52nd (top) floor of the 555 California Street Building, formerly the Bank of America Center, in San Francisco, California. The average cost of an entree there was $50 to $75. (The restaurant was so named because 555 California Street is a building whose outer cladding is composed of carnelian colored granite.) The restaurant went out of business on 31 December 2009 because of the continuing impact of the 2008 economic crisis on the United States economy. In 1898, Herberton Williams, a Campbell Soup Company executive, convinced the company to adopt a carnelian red and bright white color scheme, because he was taken by the crisp carnelian red color of the Cornell University football team's uniforms. The Carnelian Cube is a fantasy novel written by L. Sprague de Camp and Fletcher Pratt. It was first published in hardcover by Gnome Press in 1948. Carnelians is a science fiction novel written by Catherine Asaro, first published in 2012. Carnelian is the main color of the Los Angeles Angels of Anaheim Major League Baseball (MLB) franchise. ↑ "Carnelian Room calling it quits". San Francisco Chronicle. Hearst Communications. 2009-08-03. Retrieved 2009-08-11.